Allow me to introduce you to "net neutrality" if you haven't heard of it yet. Hindu had an editorial about why it is important yesterday. Net Neutrality is the concept that all data traffic on the Internet should be considered equal. There shall be no discrimination. So, say, if you pay for 1MBps Internet, your ISP should give you 1MBps itself (neither high, nor low) no matter if you use torrents, or WhatsApp, or Facebook, or Wikipedia, or YouTube, or whichever site/service you're connecting to. 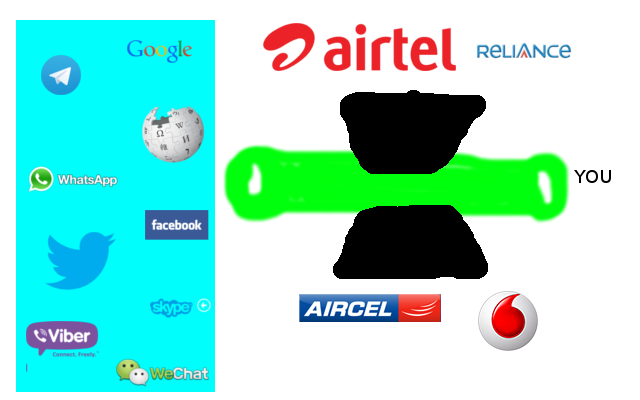 But, for people like Reliance, Airtel, Uninor, Vodafone, etc this is bad for their pocket. Because people won't send SMS or make phone calls, they can get money only via data packs. And they are greedy for making more money. So, what they have been trying to do, is to charge people differently if they're using Viber, WhatsApp, Facebook, etc. This comes in the form of "free" Wikipedia, "free" Facebook offers, or "special" Facebook packs, "special" WhatsApp packs, etc. These all give differential treatment for different services. And that is bad! Last week, they forced TRAI to release a consultation paper for "regulating" (read: putting restrictions on) these services (Over The Top services - Whatsapp, Facebook, etc.). According to this paper, a lot of ideas - like licensing the OTT services, slowing them down unless you pay TSPs more, making the OTTs pay the TSPs, etc - are being considered to be put in place. If anything is unclear, please ask in comments.